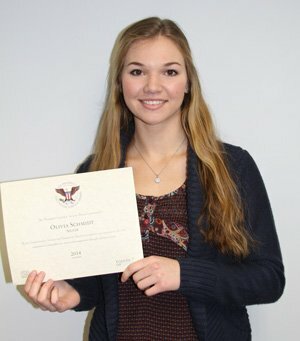 Hamilton High School senior Olivia Schmidt from Sussex received the President’s Volunteer Service Award in recognition of her exemplary volunteer service. The award recognizes Americans of all ages who have volunteered significant time to serve their community and country. It is granted by The Prudential Spirit of Community Awards on behalf of President Barack Obama. Schmidt earned the recognition by volunteering on church mission trips in Indiana and South Dakota where she worked with children and painted houses. She has been an active volunteer in the local community as a member of the Sussex LEO club and National Honor Society.